Munich – A life-saving treatment for heart failure with reduced ejection fraction (HFrEF) can be initiated and uptitrated in patients recovering from an episode of acute decompensation soon after stabilization, according to a multicenter randomized trial. The therapy, a combination of a neprilysin inhibitor and an angiotensin receptor blocker, is already recommended for HFrEF in guidelines from the ESC, the Canadian Cardiovascular Society (CCS), and the American Heart Association (AHA). Previously, the optimal timing of uptitration following decompensation had not been studied, but the data demonstrate treatment may begin before hospital discharge. Early initiation of effective therapy for HFrEF after stabilization of acute decompensated HFrEF (ADHF) is a goal, because these patients face “particularly high risks during the first two to three months [after stabilization] when mortality can approach 10%,” reported Dr. Rolf Wachter, Clinic and Policlinic for Cardiology, University Hospital, Leipzig, Germany. The rehospitalisation rate at 30 days is approximately 25%. A previous landmark study associated an angiotensin-receptor-neprilysin inhibitor (ARNI) with a mortality benefit in HFrEF but this was not studied in relation to ADHF. The newly-completed TRANSITION trial, led by Dr. Wachter, fills a knowledge gap. Prior to the TRANSITION trial, the ARNI agent sacubitril/valsartan became an evidence-based recommendation for HFrEF following publication of the PARADIGM-HF trial (McMurray JJV et al. N Engl J Med. 2014;371:993-1004). In patients with NYHA class II or greater HFrEF, the ARNI was associated with a 20% reduction (P<0.001) in death from cardiovascular (CV) causes or hospitalization for HF relative to the ACE inhibitor enalapril. Moreover, the ARNI was associated with a reduction in all-cause mortality and activity-limiting symptoms, such as dyspnea and fatigue, as measured with the Kansas City Cardiomyopathy Questionnaire (KCCQ) (Fig. 1). TRANSITION Trial: When to Initiate Treatment? In TRANSITION, HFrEF patients stabilized after an episode of ADHF requiring hospitalization were randomized to initiate sacubitril/valsartan during the index hospitalization once patients were stabilized and ready to discharge or after hospital discharge. The primary endpoint was proportion of patients reaching the 97/103 mg dose of sacubitril/valsartan b.i.d. within 10 weeks of randomization. Regardless of whether patients were initiated on sacubitril/valsartan in the hospital or after discharge, about half achieved the target dose by 10 weeks. 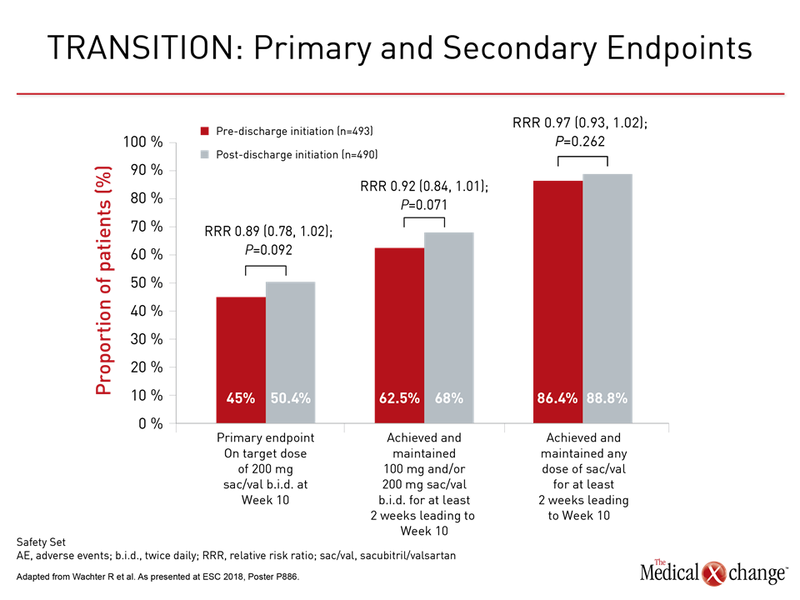 As demonstrated with secondary endpoints, most patients in both randomized groups were able to achieve and maintain the ARNI agent on board within 10 weeks (Fig. 2). Also important, the proportion of patients who permanently discontinued the ARNI treatment within the first 10 weeks was low in either group. Some of the adverse events, such as cardiac failure (7.7% vs. 7.0%) and atrial fibrillation (0.8% vs. 0.6%) were numerically higher in the group randomized to post-discharge sacubitril/valsartan, but these were not reported as statistically significant. Mortality rates were low in both groups (2.6% vs. 2.0%; P=0.6740). “Initiation of treatment in a wide range of HFrEF patients in hospital or shortly after discharge was feasible and, overall, well tolerated,” noted Dr. Wachter, summarizing the findings. In the TRANSITION trial, 1002 patients with NYHA class II or higher HFrEF (LVEF ≤40%) hospitalized for ADHF were randomized 24 hours after hemodynamic stabilization. More than 150 centers in 19 countries participated. Whether randomized to pre-discharge or post-discharge initiation of sacubitril/valsartan, a 36-hour washout was required for anyone taking an ACE inhibitor to reduce risk of angioedema. The recommended starting dose of sacubitril/valsartan was 49/51 mg b.i.d. but dose modifications were permitted. Although cardiac failure was the most common serious adverse event in either group, no other serious adverse event occurred in more than 0.8% of patients with the exception of acute kidney injury, which occurred in 1.2% of those randomized to pre-discharge and 1.4% of those randomized to post-discharge sacubitril/valsartan. The events occurring less often, such as hypotension, hyperkalemia, and renal failure, also occurred at similar rates in the two groups. There were no permanent discontinuations due to hypotension. Whether the ARNI treatment was initiated prior to or following hospital discharge, patients “with fewer comorbidities, higher systolic blood pressure, or newly diagnosed HF were more likely to tolerate the up-titration of sacubitril/valsartan to the target dose within 10 weeks,” Dr. Wachter reported. By odds ratio (OR), the strongest predictor of reaching the target dose was initiating therapy with 100 mg rather than 50 mg of sacubitril/valsartan (OR 2.41; P<0.0001). Other significant predictors included positive medical history of hypertension (OR 1.85; P=0.0005), absence of atrial fibrillation at baseline (OR 1.77; P<0.0001), and absence of substantial renal dysfunction at baseline, defined as eGFR of at least 60mL/min/1.73 m2 (OR 1.52; P=0.005) (Fig. 3). The significance of TRANSITION is that it encourages initiating a potentially life-saving therapy as quickly as possible after recovery from ADHF. Until TRANSITION, essentially all the landmark studies that established the current evidence-based therapies in HFrEF, including PARADIGM-HF, were conducted in patients with chronic and stable HF. The previously published TITRATION trial, which established an acceptable safety profile for reaching the target dose of 200 mg sacubitril/valsartan with uptitration schemes over 3 to 6 weeks, did include a small number (<12%) of hospitalized patients (Senni M et al. Eur J Heart Fail. 2016;18:1193-1202), but the TRANSITION trial was designed specifically to evaluate the tolerability of initiating an HF treatment in patients stabilized after a decompensation event, which is a period of high vulnerability to recurrence and readmission. 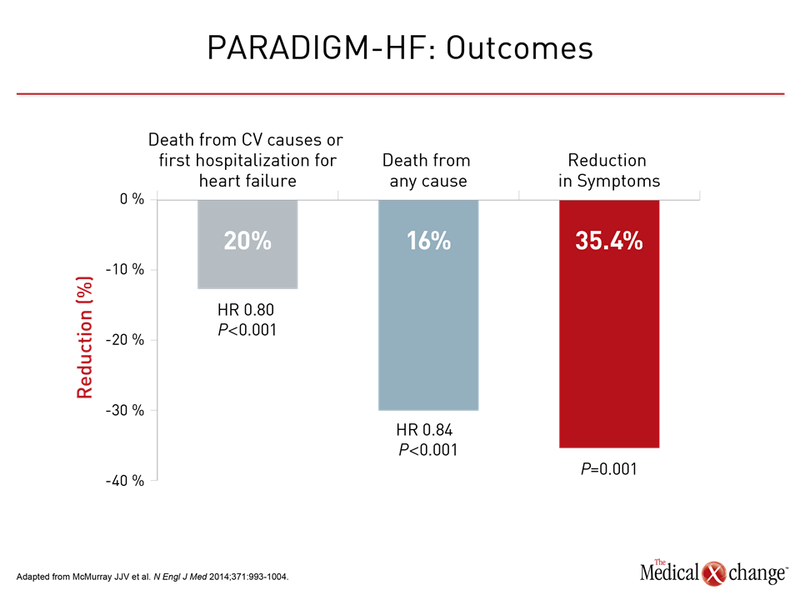 “A hospitalization for decompensation of HF increases the risk of CV death by almost three times with the greatest risk in the first weeks after discharge,” emphasized Dr. Michele Senni, Cardiology Division, Hospital Papa Giovanni XXIII, Bergamo, Italy, who was a co-author of both the TRANSITION and TITRATION trials. 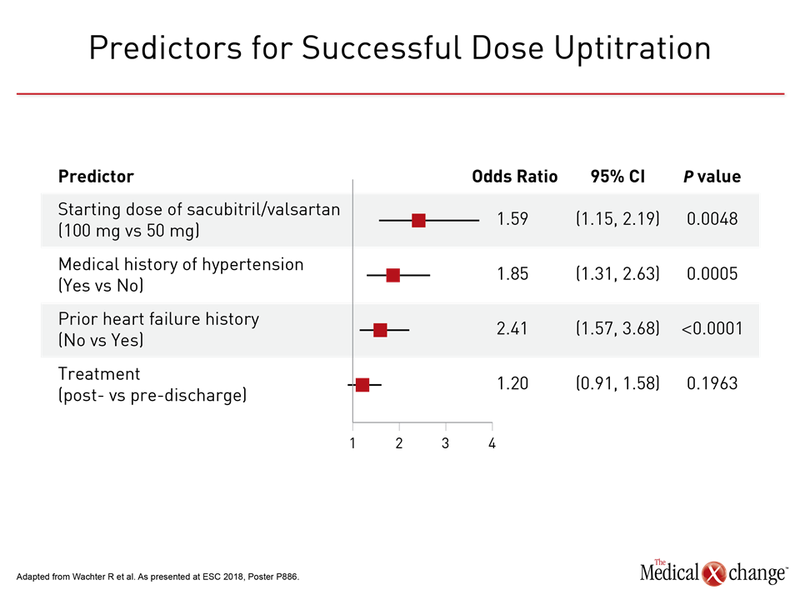 Providing context for the TRANSITION data, Dr. Senni noted that the ESC guidelines “recommend the optimization of chronic HF treatment while the patient is hospitalized.” TRANSITION demonstrates the feasibility of achieving this directive with sacubitril/valsartan in what Dr. Senni described as a “real-world” population. 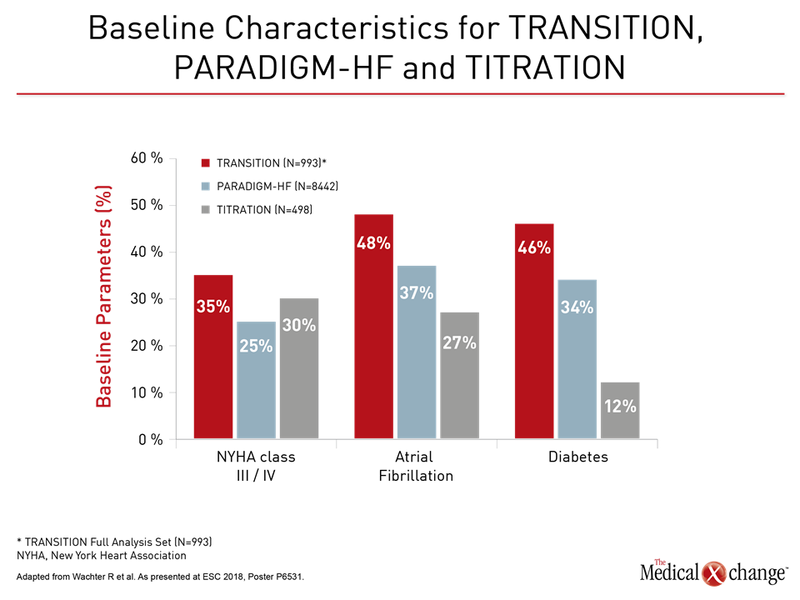 “Relative to the PARADIGM-HF and TITRATION trials, the TRANSITION patient population was older, had more severe HF symptoms, and had more comorbidities, representing a broad spectrum of HFrEF patients hospitalized for ADHF,” Dr. Senni reported. This included higher rates of NYHA class III/IV HF, pre-existing atrial fibrillation, and diabetes (Fig. 4). The proportion of patients with eGFR <60 mL/min/1.73m2 was significantly higher (P<0.0001) in TRANSITION (51%) versus PARADIGM-HF (37%) or TITRATION (34%) and older (67 years in TRANSITION vs. 64 years for the others; P<0.0001). Other real-world data presented at the ESC also support the safety of sacubitril/valsartan in a broad population with multiple unfavourable clinical features. In a single-center study that evaluated 112 HFrEF patients initiating sacubitril/valsartan since 2016, 57 (51%) had one or more high-risk criteria. These included 25% with renal impairment, defined as eGFR <45 mL/min/1.73 m2, 44% with hyperkalemia (>5 mmol/L) and 40% with systolic hypotension (<110 mmHg). Over an average follow-up of 275 days, 44% achieved the highest dose, while only 5 patients (4%) discontinued therapy. Two of the discontinuations were for hypotension. Of the remaining three, one was for acute renal dysfunction, one for gastrointestinal disturbance, and one for implantation of a ventricular assist device. “Our data suggest that sacubitril/valsartan appears to have good safety even in patients with a high-risk profile,” reported Dr. Joana P. Nevia, University Hospital, Vila Franca de Xira, Portugal. In the PARADIGM-HF trial, HFrEF patients were required to have NYHA class II or greater symptoms, LVEF ≤40%, and a plasma B-type natriuretic peptide (BNP) of ≥150 pg/mL. Although the clinical benefits from PARADIGM-HF provided the basis for guideline recommendations, the specific wording of these recommendations has varied. This is leading to some potential disparities for the provision of a potentially life-saving drug, according to Dr. Andrew Clark, Head of the Cardiology Research Group, Hull York Medical School, York, UK. In reviewing clinical data from his own institution over a 13-year period, he estimated that less than 30% of patients would be eligible if PARADIGM-HF entry criteria were applied strictly. Conversely, among the 2,624 evaluated patients with NYHA class II or higher HFrEF for whom there was no missing data, 88% would have filled AHA criteria and 75% would have met criteria issued by the UK’s National Institute of Clinical Excellence (NICE), according to Dr. Clark. Some of the limiting factors in the ESC criteria not required by AHA and NICE criteria include documentation of elevated BNP and prior exposure to all three members of standard HF triple therapy (beta blocker, mineralocorticoid receptor antagonist, and renin-angiotensin system antagonist). “Harmonizing recommendations and reconciling differences are likely to be welcomed by both patients and clinicians,” observed Dr. Clark, indicating that some HFrEF patients may be deprived of a treatment with a proven mortality benefit. Based on a survey of an Italian HF registry, Dr. Giuseppe di Tano, Department of Cardiology, Hospital of Cremona, Italy, made a similar point. 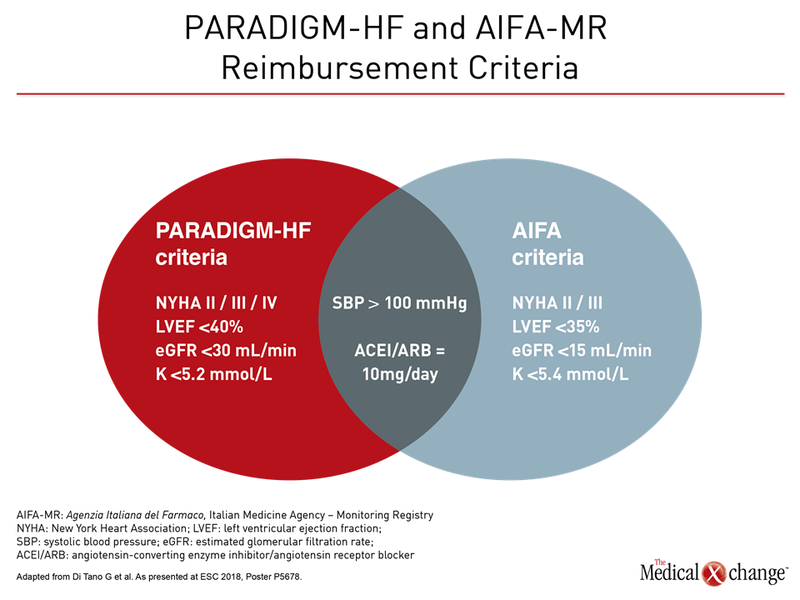 He evaluated the eligibility of 1026 chronic HF patients for ARNI therapy using both PARADIGM-HF study entry criteria and reimbursement criteria by the Italian Medicines Agency (AIFA). Relative to the PARADIGM-HF enrollment criteria, the Italian reimbursement criteria permitted treatment of patients with greater renal dysfunction (>15 vs. >30 mL/min/1.73 m2), greater left ventricular impairment (LVEF <35% vs. <40%) and a higher upper level of hyperkalemia <5.4 vs. <5.2 mmol/L) (Fig. 5). In Canada, the guidelines recommend consideration of a change from an ACE inhibitor or angiotensin receptor blocker to ARNI in HFrEF patients who remain symptomatic despite optimal and tolerated doses of guideline-directed medical therapy (Ezekowitz JA et al. Can J Cardiol 2017;33:1342-1433). This recommendation was characterized as “strong” with “high-quality evidence” for the goals of reducing CV death, HF hospitalizations, and symptoms. In the months following stabilization after an acute decompensation, HFrEF patients are at disproportional elevated risk for rehospitalizations and CV mortality. Early optimization of heart failure therapies during this period is an important strategy for reducing these risks and is recommended by the ESC. The TRANSITION trial has documented that initiation of sacubitril/valsartan, which has been associated with an all-cause mortality benefit and is guideline recommended for HFrEF, may be initiated in hospital or soon after discharge with acceptable tolerability. The study demonstrates that the substantial proportion of HFrEF patients, including those with high-risk features, and many can tolerate the highest dose within the first 10 weeks.